They Were a Talented Team with a Near-Perfect Record. But for Five Straight Years, When it Came to The Crunch of the Playoffs, the Amherst Lady Hurricanes-A "Finesse" High-School Girls' Basketball Team of Nice Girls from A Nice Town-Somehow Lacked the Scrappy, Hard-Driving Desire to Go all the Way. Now, Led by the Strong Back-Court of All-American Jamila Wideman and Three-Point Specialist Jen Pariseau, and Playing beyond Their Personal Best, this is Their Year to Prove Themselves in the State Championships. Their Season to Test Their Passion for the Sport and Their loyalty to Each Other. Their Time to Discover Who they Really are. 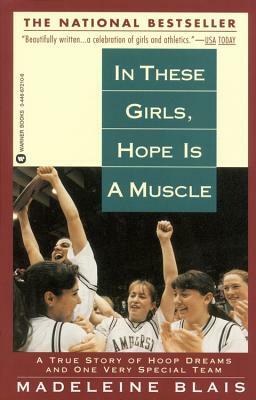 In These Girls, Hope is a Muscle is the Fierce, Funny, and Intimate look into the Minds and Hearts of one Group of Girls and Their Quest for Success and, Most Important of all, Respect. Madeleine Blais, a former reporter for the Miami Herald, is currently a faculty member at the University of Massachusetts. A collection of her articles, The Heart Is An Instrument: Portraits in Journalism, was published by the University of Massachusetts Press in 1992.